Eventually, absolutely everyone needs a bit of restorative dentistry. Chipped, cracked, broken, decayed, and missing teeth are very common problems even for people who brush and floss regularly! If your smile needs a little help to look and feel its best, then you can trust Dr. Swearingen to provide the care you need. Combining the highest-quality materials with his meticulous attention to detail, he can help rebuild your smile in such a way that even YOU will have trouble seeing your dental work! To start getting your complete smile back, contact us today. 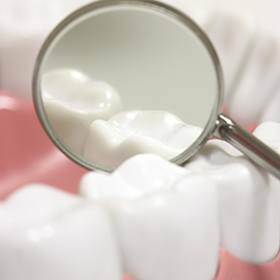 When it comes to repairing stained, weakened, or fractured teeth, nothing does it better than a traditional dental crown. A crown is actually a tooth-shaped “cap” that is placed directly over a natural tooth to protect it and restore its strength and appearance at the same time. Each crown is custom-made for every patient, so the end result is always functional and beautiful. You can get a crown made just for your smile in as little as two appointments. And, dental crowns can even help replace one or more missing teeth in a row. Two dental crowns can be placed on both of the teeth surrounding the gap in a person’s smile, and these can be attached to prosthetic teeth to close it. This not only improves the appearance of the smile, but it also evens out the bite and prevents the other teeth from shifting out of place. 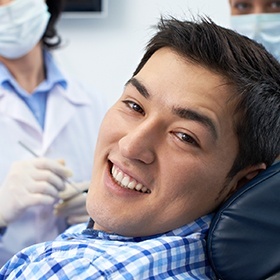 Tooth-colored fillings allow us to do what is simply impossible with traditional silver fillings: restore your small cavities without altering the appearance of your teeth. 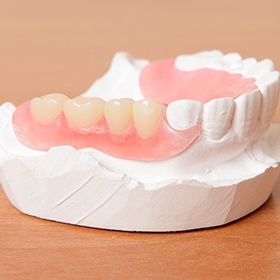 These fillings are made of a composite resin, which in addition to being just as strong and durable as silver, can also be specially shaded to match a patient’s tooth color. Even better, this material allows us to use smaller fillings while repairing the teeth, enabling our team to preserve more of your natural teeth’s strength in the process. If your confidence and diet are affected by numerous missing teeth every day, then dentures can help make all of those problems finally go away. Partial dentures can replace multiple missing teeth while fitting in seamlessly with the remaining ones (like a puzzle piece), while full dentures can help us bring back an entire row of teeth. In the end, no matter what you need, we can provide a prosthetic that helps you reclaim your smile again. 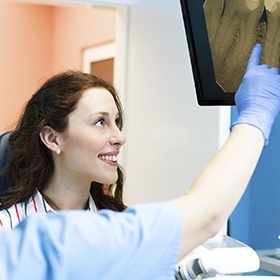 A root canal is a procedure we use to treat teeth that have suffered damage to the dental pulp, which is where the sensitive nerve of each tooth is located. This can bring on the mother of all toothaches, but thankfully, we know just how to relieve it and even save the tooth. Dr. Swearingen will gently remove the damaged tissue, disinfect the tooth, and top it with a new restoration so you can say “goodbye” to pain and “hello” to a healthy smile.